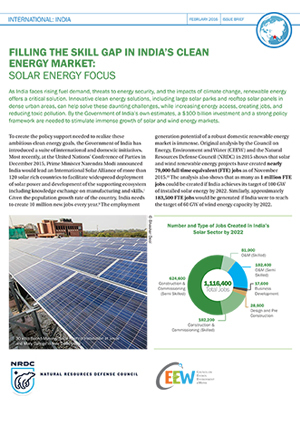 The Council, along with the Natural Resources Defence Council (NRDC) India, conducts annual surveys of India’s solar and wind markets in order to analyse both short and long-term renewable energy job creation. Job creation and skill development are key priorities for the Indian government. Jobs created from renewable energy offer a significant opportunity to meet the government’s objectives on employment generation. 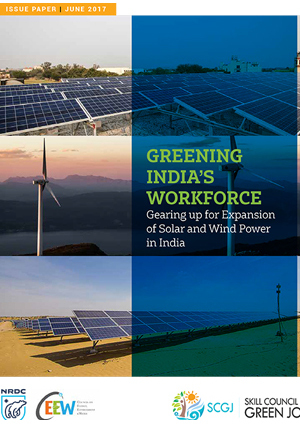 However, credible information on the number of jobs that have been created so far, and those that can be created in future to achieve India’s renewable energy goal of 175 GW by 2022, has been lacking. 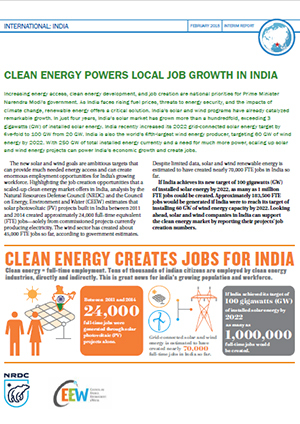 Results from the latest study find that India's ambitious renewable energy goals could generate thousands of new jobs while meeting India's climate and economic goals. Solar and wind energy employed over 21,000 people in 2016-17 and will employ 25,000 or more in the following year. The labour-intensive rooftop solar segment will employ 70 per cent of the new workforce, creating seven times more jobs than large-scale projects such as solar farms. In the next five years, 3,00,000 people will be employed in the solar and wind energy sectors. Domestic solar manufacturing industry could provide full-time employment for an additional 45,000 people in India. Solar jobs will be well distributed across India with Maharashtra and Uttar Pradesh leading in job creation. Wind jobs are likely to be concentrated in a few states that have high wind potential, as has been the case with wind capacity. Eighty per cent of the new clean energy workforce will be employed during the construction phase. However, despite these being contractual jobs, the large pipeline of renewable energy projects creates enough opportunities for workers to stay employed. Promote reporting of employment generation from renewable energy companies. 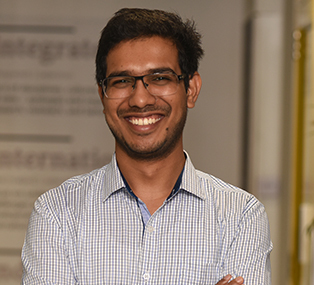 Provide a greater impetus and policy priority to rooftop solar to create renewable energy jobs and meet the government’s employment objectives. Support development of training centres led by the private sector to source construction jobs locally since solar jobs are well distributed among states. 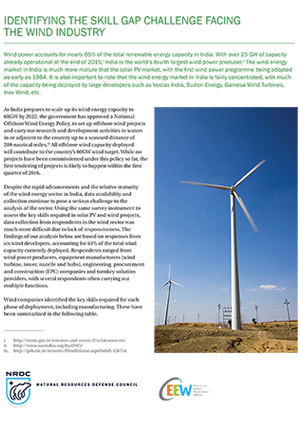 Develop wind power training centres based on state specific wind targets in 8 states. Promote a strong domestic solar manufacturing industry to provide employment to an additional 45,000 people in India.